We Can Ship On The Common Carrier Of Your Choice, Fedex Ground, Towne Air, Yellow freight, etc. Available for shipping twice per month. The sharpest cutting unit to cut bunches up to max. ø 12 cm. Special steel that stays sharp for a long time. Clean cut improves water uptake and reduces risk of bacterial attack. Same as small model but for bunches up to max. ø 18 cm. Bunch cutter with safety protection, for bunches up to max. ø 12 cm. This unique design prevents any damage to the hands and fingers whilst the cutter is in the indicated position because the top and bottom knives are fully protected. 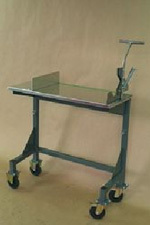 A stable and mobile table + cm indicator. This construction gives you the opportunity to cut the bunch in the exact length. It is easy to move/store and it has a tight design. b) Spring for bunch cutter. Deleafing machine with brushes on both sides. Constant speed. Coloured 4-comb brushes that are easy to mount and last longer. Supporting frame and collection bag are optional. Power supply; 110V or 230V, 1 phase + zero + earth, 50Hz. Supplied with English, Canadian or European plug. 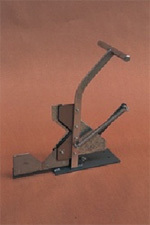 Deleafing machine developed after scouting visits at rose farms in Kenya. Duo Defoliator equipped with 2 engines of 37Kw each instead of one. 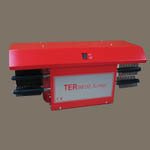 This unit can easily support 8-comb brushes whilst the standard machine is officially too light. Extra wide, giving more space for two people working on it. Technical improvements: improved cooling of engines and bearings. Eight bearings instead of four. Two V-belts per engine. Supporting frame and collection bag are optional. Power supply; 110V or 230V, 1phase + zero + earth, 50Hz. Supplied with English, Canadian or European plug. 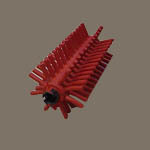 4-comb rubber brushes for Bercomex DuoFlor, DOMV, DOMC, EOM/CR and Terlouw Duo defoliators. In 3 grades: soft (green), hard (blue), extra hard (red). 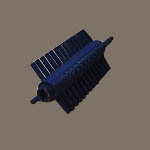 8-comb rubber brushes for Terlouw heavy duty defoliator. In 3 grades: soft (green), hard (blue), extra hard (red). 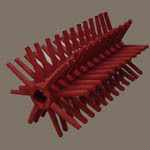 8-comb rubber brushes for OptiFlor. In 3 grades; soft (yellow), hard (blue), extra hard (black). 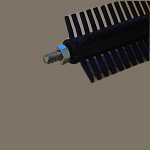 BRUSHES for older type Olimex defoliating machines. 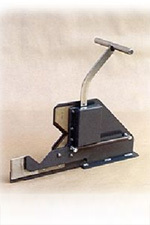 UFO Supplies can supply brushes for old model Olimex defoliating machines (DOM, EOM, ORM). 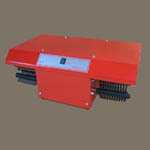 These type machines have brushes which are mounted on the machine with a threat end. These type of brushes go per pair and are available in soft, hard and extra hard. 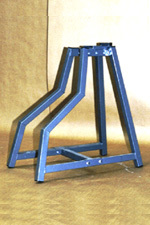 SUPPORTING FRAME for Duoflor and Terlouw units. 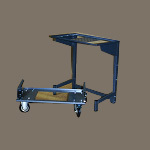 Durable stable frame adjustable in height, economically packed ideal for air transport. COLLECTING BAG for Duoflor and Terlouw units.